Information on how Atos Origin and Unum run their businesses and their impact on the DWP ESA and Atos Healthcare medical examinations and assessments. For an excellent overview I commend: ATOS HEALTHCARE OR DISABILITY DENIAL FACTORIES: RESEARCH SUMMARY (http://blacktrianglecampaign.org/2011/08/23/important-read-circulate/). This website provides information on how Atos runs its business, extracts from the Contract between the DWP and Atos including the MEDICAL CONDITIONS that mean a face to face medical assessment is not always necessary, ASSESSMENTS AND POINTS, the breaches of Contract that occurred in my case, my unsound medical report and the correspondence showing how difficult it is to obtain justice or advice. The Government is inviting the public to submit petitions. Search epetitions.direct.gov.uk for “DWP” or “Atos” or “disabled” to list relevant petitions including Stop and review the cuts to benefits and services which are falling disproportionately on disabled people, their carers and families (http://epetitions.direct.gov.uk/petitions/20968). Other ongoing petitions are Petition against constant vilification of sick and disabled claimants and Petition to “Sack Atos Immediately” . The DWP occasionally consults the public http://www.dwp.gov.uk/consultations/. Atos Origin appears to have followed the approach of the discredited Unum company in the US. Unum in the US describes the fines in the US for operating “disability denial factories”. Unum in Wales describes Unum’s funding of the activities of Professor Mansel Aylward, the former Chief Medical Adviser at the DWP and head of the UnumProvident Centre, Cardiff University. Unum in the UK describes their activities in the UK including their contributions to creating the regulations that implemented the Welfare Reform Act. In 2001 Schlumberger bought SEMA for $5bn. In 2003 Atos Origin bought Schlumberger SEMA, an IT Services company. At that time the Atos Origin had 50,000 staff and annual revenues of €5bn. Reuters reported in February 2010 on KPMG. It mentioned that KPMG sold its original consulting practice to IT services group ATOS Origin in the wake of the Enron scandal (http://en.wikipedia.org/wiki/Enron_scandal). Many executives at Enron were indicted for a variety of charges and were later sentenced to prison. Atos Origin has such a poor track record. The examples below are just a few of those that highlight the way this company is managed and operates after the DWP hired Atos Origin. Atos Origin claim on their website in September 2010. Atos Healthcare conducts DWP disability assessments for people claiming a range of disability benefits including Employment Support Allowance, Incapacity Benefit, Disability Living Allowance, and Industrial Injuries Disablement Benefit. Each year we process over 1.2 million referrals for medical advice and provide over 800,000 face-to-face medical assessments via our nationwide network of over 140 medical examination centres. Seriously ill cancer patients are being forced to undergo “cruel” back-to-work interviews despite the fact they should be exempt, charities warned today. Those who are terminally ill or undergoing chemotherapy or radiotherapy are being threatened with benefit cuts if they do not attend the meetings, according to Macmillan Cancer Support and Citizens Advice. The “fit for work” interviews are for people seeking the employment and support allowance (ESA), which replaced incapacity benefit and income support in October 2008. Diamond company De Beers has launched an £8.6m compensation claim in the High Court following a row with software group Atos Origin. …But as work progressed, De Beers became concerned about progress and slippages in the timetable for delivery of software…. Inquiry into loss of confidential data on 12 million website users. The Independent on 3 November 2008 by Kim Sengupta. An investigation is underway after a memory stick with user names and passwords for a government computer system was found in a pub car park, leading to the shutting down of the website as a security precaution. With critics lambasting the latest security breach, the Prime Minister intervened in the affair to say that the Department for Work and Pensions would be taking action and the company which lost the information, Atos Origin, could face changes to its five year contract worth 46m. The memory stick lost in the latest incident was found in the car park of the Orbital pub in Cannock, Staffordshire, where Atos Origin is based. UP TO 900 people are to be recalled for medical scans after a series of blunders by a private company. NHS bosses last month suspended tests being carried out by Atos Origin at centres in Manchester, Salford, Bolton, Stockport, Oldham, Wigan and Liverpool, after discovering technical and administrative problems. Now regional health bosses are set to write to the 900 patients who had ultrasound tests to investigate conditions like kidney, prostate and abdominal problems at Atos centres to offer them the chance to be re-scanned at NHS hospitals or private companies. Following complaints by a former GP at the privately-run NHS Walk-in Centre at Canary Wharf, the Nursing and Midwifery Council has started an investigation. …nurses at the centre were expected to do work for which they were unqualified and were consequently putting patients at risk. Almost 80,000 sick and disabled people a year are being wrongly denied benefits, according to a BBC investigation for Radio Five Live. It has emerged that medical reports on people claiming some benefits are unreliable or inaccurate. As a result, thousands claiming Incapacity Benefit or Disability Living Allowance have had to appeal. The government says that it is “responding positively” when criticisms are made. The investigation found that some handwritten medical reports were altered so that the meaning was completely changed, while in other cases a computer-based medical questionnaire produced misleading or nonsensical information. Atos Origin doctors send their reports to civil servants who make a final decision about a person’s entitlement. DWP hires Atos Origin to provide medical assessments. The Department for Work and Pensions (DWP) has awarded services company Atos Origin a £500m seven-year contract for the delivery of medical advice and assessment services. Under the contract, Atos Origin will manage the provision of medical advice and assessments on behalf of the DWP for benefits including Incapacity Benefit, Disability Living Allowance, Industrial Injuries Disablement Benefits, and others. In addition, services will also be provided to the Ministry of Defence Veterans Agency. The highlights that relate to the financial information published on the Atos Origin (http://www.atosorigin.com/) website. …reported revenue of EUR 1,231 million for the first quarter of 2010 representing a decline of -5.5 per cent at same scope and exchange rates…. …Several new contracts were signed during quarter one including …Vehicle and Operator Services Agency (VOSA) (http://www.dft.gov.uk/vosa/) in the United Kingdom for Managed Services…. …In Medical BPO, the revenue was EUR 40 million, representing 3 per cent of the Group and was up +7 per cent thanks to an increase in the number of medical assessments processed in the United Kingdom…. In the United Kingdom, revenue totalled EUR 211 million down -2.4 per cent organically. In Managed Services, the revenue increased +2 per cent thanks to the growth in the Public Sector and Financial Services markets. Systems Integration was down in the Private Sector while it remained strong and growing in the Public Sector. In Consulting, revenue decreased by EUR -3 million due to lower revenue in Health while the Financial Services market started to recover. In HTTS, the revenue grew +8 per cent with the ramp-up of the contract with Capita and an increase in payment transactions. Finally, Medical BPO reported a +7 per cent growth mainly thanks to the increase of transaction volumes. …Representing 3% of the Group, Medical BPO revenue was EUR 153 million, up +3.5 per cent at constant scope and exchange rates. This business is fully operated in the United Kingdom only with increasing volumes with all the major clients, particularly for occupational health services…. In the Rest of the World where operating margin increased from 3.9 per cent to 6.5 per cent of revenue. The main signatures of the fourth quarter were: in the United Kingdom, in Managed Services with Brakes in manufacturing, in finance with Capita Life & Pensions; in the public sector with Skills Development Scotland (http://www.skillsdevelopmentscotland.co.uk/) and with UK Government Gateway (http://www.gateway.gov.uk/) in High Tech Transactional Services (HTTS) . …The full qualified pipeline as of 31 December 2009 was EUR 3 billion up +14 per cent compared to 2008, mainly thanks to HTTS and Medical BPO; Systems Integration showed a slight increase. Governments, like companies, like to pick and choose those elements of research that best fits the short term objectives of the time. There are rigorous scientific and engineering disciplines and there are those which are less so. Academics are asking the following questions and similar. Is eugenics scientifically credible even if socially unacceptable? How did eugenics relate to “Survival-of-the-fittest” Social Darwinism? How does “welfare-to-work” and “fit-for-work” relate to Social Darwinism? Prior to World War 2, there was a widely held view that there was some evidence of correlation between social behaviour and the physical characteristics of individuals. It was suggested that individuals with particular features were more likely be “criminal” types and so, to protect society, should be placed in locations where their activities can be closely monitored. Politicians can influence scientific opinion. The rational scientific world has seemed to have moved on from the primitive and barbarous view of many religions, widely held until recent times, that sickness is a punishment by a deity and as such is just if prayers or votive offerings fail to cure the sickness. Irrational delusions can influence politicians. Here is an extract from some of the information published on the London School of Economics (LSE) (http://www.lse.ac.uk/) website. Document locations change frequently so it is best to use the search facility. The research of Lord Richard Layard and Stephen J Nickell has strongly influenced labour market reforms in Europe. Lord Richard Layard is emeritus professor of economics at LSE and a Labour life peer in the House of Lords. Stephen Nickell is Warden of Nuffield College, University of Oxford, and was previously a professor of economics at LSE and a member of the Bank of England Monetary Policy Committee. They have produced ground-breaking work on the relationship between labour market institutions and unemployment. Their research provided a theoretical and empirical framework for the analysis of equilibrium unemployment and the impact of labour market institutions on economic performance. The “welfare-to-work” approach now adopted by many nations draws on their finding that generous unemployment benefits need not be detrimental if they are granted only for a limited time and are accompanied by adequate instruments that require (and assist) unemployed individuals who are able to work to actively search for a new job. Other work by Layard and Nickell provides evidence that stricter employment protection regulations do not generally increase the level of unemployment, but increase the persistence of unemployment by reducing short-term unemployment at the cost of raising long-term unemployment. They have also shed light on the interaction between wage setting institutions and unemployment. In particular, they were able to show that higher union coverage tends to increase unemployment, but these negative effects of collective wage bargaining can be offset if unions and employers coordinate their wage bargaining activities effectively. Individuals and the state have a duty of care to the less fortunate. Concepts such as “welfare to work” and “fit to work” may or may not be appropriate for the able but it is clear that these concepts can and do place more pressure on the unemployed dying, sick, disabled and their carers. Social Darwinism, if it means anything, it means weeding out the less strong in society. If this is the intent of Parliament it should be clearly stated. The Welfare Reform Act is not clear in this respect. However the implementation of the Welfare Reform Act by Atos Healthcare appears to conform to the spirit and practice of Social Darwinism. Civilisation allows man to rise above a “survival of the fittest” world. The judgements handed down at the Economists, Lawyers and Doctors Nurnberg Trials are as appropriate today as they were in 1945. Even as a medical layman, there seems to be some minor medical conditions where “fit to work” assessed though a medical examination undertaken by someone without access to the patient’s medical history or without specialist knowledge might be possible. If my leg was broken and there were no complications and it was taking longer than the time allowed before an ESA form needed to be completed, then a “few simple physical tests” might be sufficient for a “fit to work” assessment. Atos Healthcare has confirmed in writing to the Health and Safety Executive that their medical assessment comprises only a “few simple physical tests”. In the real world, the Secretary of State does not give a breakdown of the medical conditions of those denied allowances. If she said what these medical conditions were and she put forward medical experts who agreed with her that a “few simple physical tests” was sufficient to deny allowances, then concerns would lessen. Instead we hear of dying cancer patients and people with autism denied allowances, this is a concern. Dame Carol Black has called for a new approach to work-related health services, after her review found that ill health was costing the country £100bn annually. Dame Black has been commissioned by the Department for Work and Pensions (DWP) to advise on how to improve the health of those in work and reduce the number claiming sickness benefits. Black questioned the current sick note system, which she said concentrated on what people cannot do instead of what they can. She recommended that doctors’ written sick notes should be replaced with an electronic “fit note”, explaining what people were able to do even if they were ill.
At times it seems the UK Government have been influenced more by financial considerations rather than by medical considerations. My case suggests that there are similarities between the approach taken by Atos Healthcare and that of UnumProvident. Back in 2002, a class action lawsuit charged UnumProvident (now First Unum or Unum) with operating “disability denial factories”. The company also faced thousands of lawsuits filed by individuals who were denied disability claims. Despite jury verdicts against the insurer (in January 2003, a California jury reached a US$31.7 million against UnumProvident and two years later, the California Department of Insurance fined the company US$8 million because it “misinterpreted job classifications, improperly overruled doctors’ opinions and knowingly used incorrect insurance definitions to avoid paying benefits”), Unum continues bad faith insurance practices. Unum Group (formerly UnumProvident) holds about one quarter of the disability insurance market in the US, making it one of the largest providers of group disability insurance in the country. In 2004 and 2005, regulators ordered Unum to re-evaluate thousands of denied claims. According to the LA Times (April 12, 2007), the company reviewed less than 10 percent of the 290,000 claims eligible for review and potentially, re-instatement of benefits. The Unum view is published on the Unum (http://www.unum.com/) website. Document locations change frequently so it is best to use the search facility. CHATTANOOGA, Tenn.–(BUSINESS WIRE)–Oct. 3, 2005–UnumProvident Corporation (NYSE: UNM) today announced that three of its insurance subsidiaries have entered into a settlement agreement with the California Department of Insurance, concluding a market conduct examination and investigation of the subsidiaries’ disability claims handling practices. As part of the settlement, UnumProvident has agreed to change certain practices and policy provisions related to its California business and consistent with California case law. The settlement also incorporates claims handling practices previously covered by the multistate agreement reached last year with 48 other states, and includes certain additional claim handling changes. Additionally, UnumProvident has agreed to pay a fine of US$8 million to the Department as part of the settlement. Added Watjen, “Over the past two years, our company has undertaken broad changes designed to improve the quality of claims decisions and our service levels to policyholders. We made many changes during this time to improve in these areas, and added to those through the multistate settlement that was previously approved by 48 other states. Because of this, we do not believe that California’s allegations or the market conduct exam report, which is essentially a snapshot from a prior period, provide an accurate portrayal of our claim practices today. UnumProvident Centre provides funding for Psychosocial and Disability Research based at Cardiff University. The Director of the Centre is Professor Mansel Aylward. He is the former Chief Medical Adviser at the DWP and was instrumental in the DWP accepting the UnumProvident concepts applied in the US and was influential in how the Welfare Reform Act should be implemented. It is bellieved that the UnumProvident Centre has been one of the leading forces in trying to make it harder for allowances to be paid to the dying, the sick, the disabled and their carers. Staff from UnumProvident were important in the design of the Personal Capability Assessment and of the new, much harsher Work Capability Assessment required if an Employment and Support Allowance is to be paid. Professor Aylward continues to be involved in research for the DWP. He has provided support for Dame Carol Black, proponent of the replacement of sick-notes with “well-notes”. The allowance paid for ESA(C) is just under £90 per week. The current “National Minimum Wage”, set in October 2009, is £5.80 per hour. If a 40 hour week is worked, the weekly pay, before tax and NI, would be £232. The unemployed dying, the sick, the disabled and their carers have to live on just under £90 per week and for this amount have to attend repeated assessments and “pathways” meetings. Professor Aylward and Cardiff University appear to be distancing themselves from Unum. 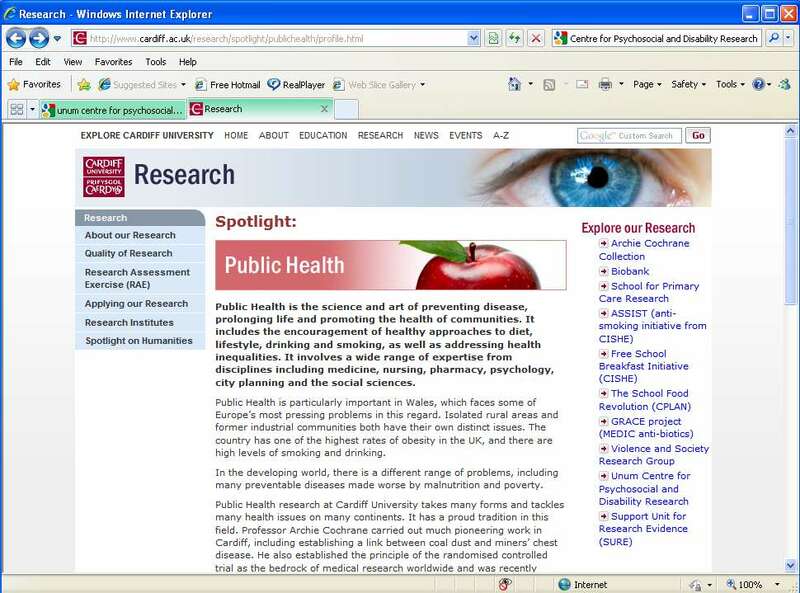 Here is an image from the Cardiff University research spotlight page taken on November 2011 (http://www.cardiff.ac.uk/research/spotlight/publichealth/). The key phrase is “The U.K. market is still in many respects underdeveloped…”. In the USA, individual states have a Department of Insurance to protect people from unfair business practices. Perhaps the UK needs a similar body to protect people from similar unfair business practices. 1990: Unum acquires National Employers Life Assurance Co. Ltd., the largest disability provider in the United Kingdom. PORTLAND, Maine (May 17, 2006) – In his comments to stockholders at the company’s annual meeting today, Thomas R. Watjen, UnumProvident Corporation (UNM) president and chief executive officer, outlined the progress the company has made over the past two years and said that, while challenges lie ahead, the future holds great promise. Please note that The Regulations in July 2008 were created with the assistance of the following UnumProvident staff. Why would such a discredited company be involved? Private equity funds interested in the healthcare services market are likely to have significant Atos Origin and Unum holdings. 28 September 2008, Centaurus Cap Sells Half of Atos Origin Stake to PAI Partners. A number of Honourable MPs have asked questions in Parliament to draw attention to the abuse of the dying, the sick, the disabled and their carers. See DWP Atos Politics for more details on press comment and extracts from Hansard. The National Audit Office (http://www.nao.org.uk/) should review the accounts and check the audit records and see how Atos Healthcare delivers the contracted for service at the cost levels that have been reported to Parliament. The relationship between the DWP, Unum and Atos Origin is very close. The Technical Working Groups were chaired by Dr. Moira Henderson, Head of DWP Health and Benefits Division. As part of implementation of the Government’s proposals for welfare reform, the Department for Work amd Pensions’ Health, Work and Wellbeing Directorate was commissioned to develop proposals for transforming the Personal Capability Assessment(PCA) from an incapacity-based tool for determining entitlement to Incapacity Benefit, to a more positive assessment incorporating assessment of capability and of health related interventions which would contribute to overcoming health-related barriers preventing people with disabilities from engaging in work. The DWP engaged Unum in September 2006 despite, as described above, in 2005 the California Insurance Commissioner described Unum (formerly Unum Provident) as an outlaw company and it is a company that has operated for years in an illegal fashion. London, 14 June 2010, Atos Healthcare, the number one occupational healthcare provider in the UK and a business division of Atos Origin, today announced that it won customer delivery supplier of the year at the Department for Work and Pensions (DWP) Supplier Excellence Awards held in London last week. The award recognises the contribution that the occupational healthcare programme delivered by Atos Healthcare has made in cutting the number of working days lost across the Department by 20%. Atos Healthcare took over management of the occupational healthcare service for the Department’s 120,000 employees in 2008. Working in partnership with the Department for Work and Pensions, Atos Healthcare has made significant improvements to processes and services. The benefits include returning employees back to work quicker, increasing employee productivity and providing more support to managers to deal with absence issues in a timely and effective manner. The Occupational Health Service helped DWP reduce its current sick pay bill by around £13m annually and increase staff resource by the equivalent of nearly 1,000 full-time posts. Assessments can now be scheduled within 4 days and customer satisfaction has increased to 91%. Improvements implemented by Atos Healthcare include the launch of a new web portal to make it easier, faster and more convenient to make an appointment and track cases; and new standards and an audit regime to ensure the quality of clinical advice. The DWP paid Atos Origin £80.6 million for the year March 2008 to February 2009. The Department for Work and Pensions re-awarded Atos Origin IT Services Ltd., trading as Atos Healthcare, a new contract to perform medical services on behalf of the Department from 1 September 2005. The total cost of these services from 1 March 2008 to February 2009 was 80,589,204. This figure not only covers the total number of examinations undertaken across all benefits, but also costs relating to written and verbal medical advice, fixed overheads, administrative costs, investment in new technology and other service improvements. Using the Atos Origin 11% operating margin stated in the annual accounts for their UK business, the profit is an estimated £8.9 million. Using figures given to Parliament I estimate the cost per assessment to be £135. For the work needed, if the work was undertaken as Parliament intended, this amount is far less than should be expected even if National Minimum Wage was paid to all staff involved. The Contract between the DWP and Atos Healthcare specifies “qualified” medical practitioners should be used. In the 12 months to September 2007, Atos Healthcare undertook 528,380 personal capability assessments. My case should have cost the time for a qualified medical practitioner to review my ESA information and then advise the DWP either my condition was terminal or my medical condition was not yet stable. In both cases the advice should have been to pay the allowance and defer indefinitely Work Focused Health Related assessments and Pathways to Work appointments. Atos Healthcare could have contacted the consultants whose contact details were all listed in the ESA information submitted. They did not contact my GP or my consultants. If Atos Healthcare had carried out the above procedure and if they used a medically qualified practitioner, as they are contractually obliged to do, it would near impossible to do this work for around £135. Of course Atos Healthcare decided on a much more profitable approach. In addition to the above they added the costs of making unnecessary appointments and a two hour interview by a medical practitioner without specialist knowledge and without access to the medical history. They added their handling charge of processing travelling expenses. Instead of charging £135 they should be able to charge the DWP at least ten times this amount. Atos Healthcare confirmed to the Health and Safety Executive that they run their operations in standard offices as they do not need specialist medical facilities. A very profitable piece of work for Atos Healthcare. It is true that the Contract between the DWP and Atos Healthcare specifies that “redo” work will be paid for by Atos Healthcare. It seems that all complaints and appeals and other costs incurred by both Atos Healthcare and the DWP are paid for by the DWP. In my case the need for “redo” work has not yet arisen. A reasonable person might suspect that the motive for long delays in investigating and resolving complaints is to increase Atos Healthcare profits. To quote Dickens’ Bleak House, “Jarndyce and Jarndyce drones on”. If Dickens were alive today perhaps the plot of Bleak House would perhaps be concerned with the business practices of Atos Healthcare. All the complaints and appeals procedures of Atos Healthcare have to be followed first. Then those of the DWP. Then those of the Parliamentary and Health Services Ombudsman. If Gilbert and Sullivan were alive today, I am sure they would draw attention to the absurdities. Unfortunately too many people are suffering and some of these die before their time, cold and uncared for. When I swooned and near fainted on the Tube after the medical assessment by Atos Healthcare, it would have been a very vigilant Coroner to put as my cause of death: Corporate Manslaughter through the negilience of Atos Healthcare. Here is a recruitment that appeared September 2010. -Carrying out telephone screening/interview calls of clinicians. or areas of potential improvement to the Recruitment Manager. -Strong PC literacy including the use of MS Word and Excel. The good news is this was for a temporary position which finishes December 2012. Hopefully Atos have been told their contract is not likely to be extended. It also suggests they have a high turnover of staff. It appears even those, like in my case, who are unable to read and write English up to the standard defined in the Contract are not willing to work for Atos. Who can blame them?